His first couple of seasons with the Giants Jeffrey Leonard really didn't contribute. Then, he turned in to a solid Major League outfielder that even helped his team win a division title. Leonard hit 19 or more HR's 3 different times with the Giants. I tried to find someone else for this slot, I really did. There was no one else. Leonard is best known for his 1987 NLCS against the Cardinals. He won the MVP of the series by hitting 4 HR in 24 AB. The Giants lost that series by the way. 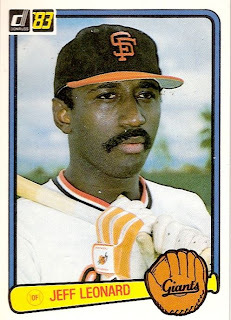 In fact 1987 was Jeffrey Leonard's year as he made his only All Star appearance as a Giant. The pickings were slim here in LF, so I wen with "One Flap Down". Jo-Jo Moore roamed left field for the New York Giants through the 1930's. He had speed and instincts, and chased down fly balls with ease. As a left fielder he led the National League in outfield assists 3 different times. Moore was a 6 time All Star, so I guess the people back then knew who he was. Here's a random tidbit. Jo-Jo Moore changed his uniform number 5 different times during his career. I wonder why. Anyway, Jo-Jo eclipsed 200 hits in a season twice. He had a lifetime batting average of .298. Three different times Jo-Jo scored over 100 runs in a season. The Giants made it to the World Series 3 times with Moore. 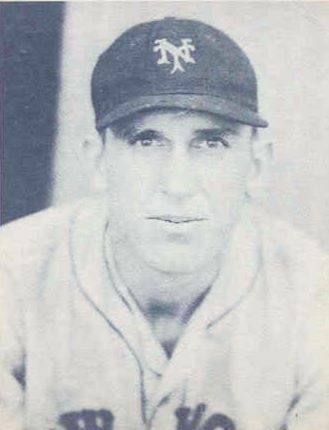 Winning only once in 1933 when Moore was playing his first full season in LF. Well if you thought this would be anything but Barry Lamar Bonds you are just crazy. I'm not a doctor, or a lawyer, so I'll just talk about what he did as a ballplayer. I will say that he was once my Giants hero, I played LF in high school. He no longer is, and it is a shame. Moving on, Barry was simply one of the best of his time. He chose to be a Giant and that meant so much. He came, and he delivered. 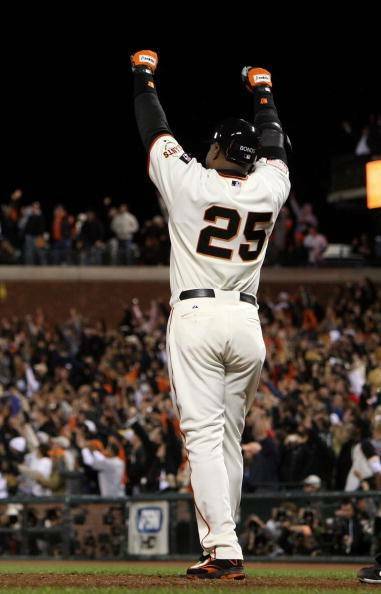 Barry Bonds won 5 MVP awards as a Giant. Amazing really, he was head and shoulders above his peers. In 2001 he torched pitchers to the tune of 73 HR's. It wasn't just the power either, he had an amazing hitting eye. Twice he led the league in hitting, and 11 different times he led in walks. Yes 11 times. As a Giant Barry batted .312 overall. He won 5 Gold Gloves and 9 Silver Slugger awards. He is second all time in franchise history with 586 home runs. Barry Bonds was one of the greatest players ever to put on spikes.